One of the most important things that a responsible cat owner can do is to make sure that they bring their pet in for an annual veterinary check-up at a trusted Southeastern Massachusetts veterinarian. Anchor Animal Hospital in Dartmouth provides a wide variety of veterinary services, including feline dental care, which are designed to increase the health and longevity of family pets in the South Coast region. Studies reveal that not enough pet owners bring their cats in for regular check-ups, choosing instead to only bring them in for a visit when the cat is sick. When it comes to feline health, many diseases have a better chance of being successfully treated if caught early. An annual veterinary check-up can help your local veterinarian catch small issues before they become significant problems that could put your cat’s life at-risk. When it comes to health issues, including illnesses and pain, cats are masters of disguise. Their natural instinct is to hide any sickness from predators and other cats, as a means of protecting themselves. Unfortunately, this means that it can be difficult to ascertain the health of your cat fully. They are great at hiding pain and discomfort, which means that without proper care from an experienced Southeastern Massachusetts veterinarian, your cat could be suffering and you might not even know it. Feline dental care is critical, as dental disease is considered to be the most common disease found in cats. By the age of three, the majority of cats already have some evidence of dental disease. Your local veterinarian at Anchor Animal Hospital in Dartmouth is trained to spot signs of dental disease and other illnesses. A physical exam, as well as other tests including urine and blood, radiographs, and ultrasound technology, can all be used to diagnose many of the diseases that commonly affect cats. This is why a regular veterinary check-up is so necessary for cats of all ages. 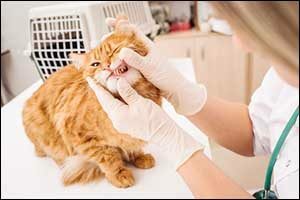 Feline dental care, as well as treatments for other types of diseases and conditions, are most successful when they occur early before things progress too far. Many of the common diseases that affect cats can affect the quality of your cat’s life and shorten their lifespan if left untreated. So the sooner something can be detected through routine trips to your Southeastern Massachusetts veterinarian, the better it will be for your cat’s health and longevity. However, some pet owners worry about costs, which is why many will skip primary veterinary care and only bring their cats in for a veterinary check-up when they appear to be sick. The truth is that the cost for treatment of advanced disease is much more costly than preventive health care, vaccinations, and early treatment of illnesses. When you visit Anchor Animal Hospital in Dartmouth, make sure to discuss a check-up plan with your veterinarian to ensure that your cat is receiving adequate exams and is on a schedule for vaccinations. Your vet will also provide you with information about diet and tips to care for your cat’s mouth and teeth at home to help keep them healthy between visits. If you have any questions about healthcare for your cat, make sure to ask your veterinarian. The more you can work together with your local veterinary office for things like diet, preventive healthcare, and feline dental care, the better your cat’s health will be now and in the future. You may be thinking that brushing your cat’s teeth sounds like a dangerous proposition. Some cats will not allow you to hold and cuddle them, let alone brush their teeth. However, dental disease is a real problem for most cats. While initial signs appear by the age of three, by the age of four, many cats will already have periodontal disease or significant gingivitis already present. Due to their “masters of disguise” abilities, even if your cat has oral discomfort, it is unlikely that you will even be aware of it. Dental pain occurs slowly and over time, so most cats just learn to live with it, and by the time they do show signs of pain, it is likely already progressed to a serious and severe point. Anchor Animal Hospital in Dartmouth provides basic dentistry and advanced dentistry to cats and dogs in Southeastern Massachusetts. Teeth cleaning and other procedures are available to our patients as part of routine feline dental care. The age, diet, lifestyle, and health conditions of your cat can contribute to dental issues, so it is important to work with your veterinarian to set a schedule for routine check-ups, exams, and cleanings to keep your cat healthy and active. The more proactive you can be, through veterinary check-ups and home brushing of your cat’s teeth, the better your cat’s oral health will be throughout their lifetime. Our vet techs can help you learn how to properly brush your cat’s teeth as part of a comprehensive approach to feline dental care. Call 508-996-3731 to schedule an appointment or to learn more about the dentistry services available at our South Coast vet clinic.